Google’s first foray into laptop hardware came in 2013 with the release of the first Chromebook Pixel. It was, and still is, a stunning feat of engineering, with a machined aluminum chassis and gorgeous high-resolution screen. At $1,299 it was far too expensive to be anything other than an extravagant reference device for Google’s fledgling browser-based operating system. By the time the second-generation landed in 2015, at a reduced price of $999, it appeared as though little had changed. Thanks to much-improved battery life and a quickly developing operating system, the new Pixel was much more appealing than the original. The hefty price tag ensured its mainstream appeal was still nonexistent. Fast forward to Fall 2017, and Google was in the midst of a hardware revolution. At its second consecutive October showcase event, the software giant announced a slew of new devices, including the Pixel 2 phones, two new Home speakers, Assistant-enabled wireless earbuds, and a brand new laptop. But the Pixelbook isn’t just another rerun with better specs and a lower price. Instead of yet again showing us what a MacBook running just a browser looks like, Google has created a convertible laptop/tablet hybrid with a touch screen and stylus. 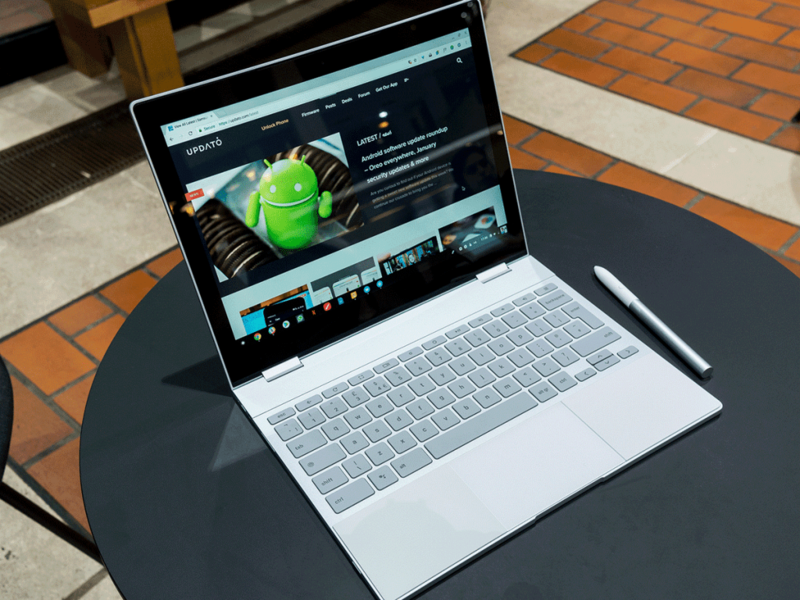 With many Android apps now available on Chrome OS, the Pixelbook might just be good enough to compete with its Windows and macOS counterparts. At $999 for the base model, the Pixelbook sits firmly in the high-end price bracket just like its predecessors. The model I’m reviewing is $200 more, with its 256GB SSD offering twice the storage of the cheaper option, with the same 8GB of RAM and an Intel Core i5 processor (seventh-gen, Kaby Lake). The top spec model runs to an eye-watering $1,649, which gets you a Core i7 chip, 16GB of memory, and a 512GB NVMe SSD, but good luck finding any applications that demand so much power on a Chromebook. The internal components are what we would expect from a premium laptop, but the external hardware doesn’t disappoint either. 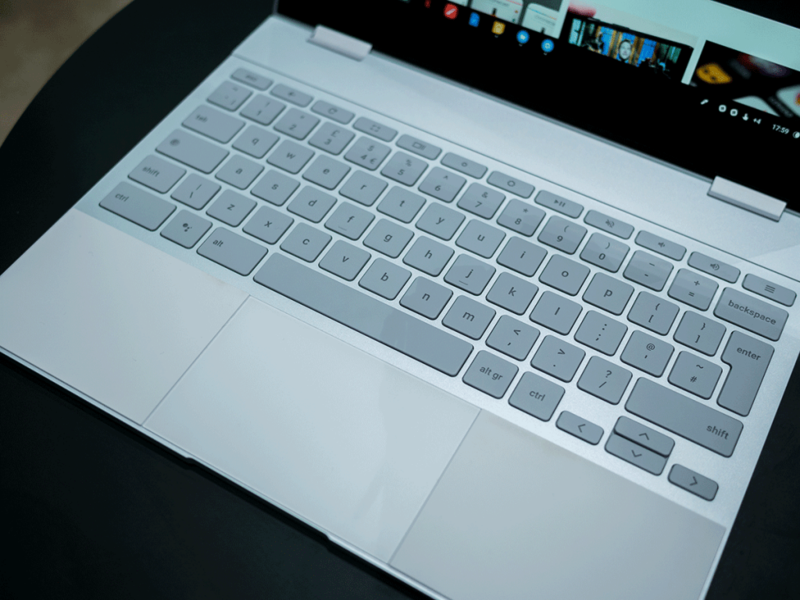 The Pixelbook’s construction is of the highest quality, with a mixture of aluminum, glass, and soft-touch silicone. The whole package feels just as premium as similarly-priced competitors, but the design is distinctly Google-y. It looks striking, but there are some really thoughtful design decisions at play too. A window made from Gorilla Glass on the rear casing follows the visual identity of Google’s Pixel phones while also allowing easy transmission of wireless signals. Silicone sections either side of the glass trackpad mimic this blocky design aesthetic and also serve as a comfortable palm rests while typing. With the screen folded all the way around into tablet mode, the silicone also adds some friction to prevent the device from slipping around on a flat surface. Just as clever is the placement of the stereo speakers in the hinges. In any of the four configurations (tablet, laptop, tent, and “entertainment” modes – see below) the speakers will aim sound directly at you, which is ingenious. 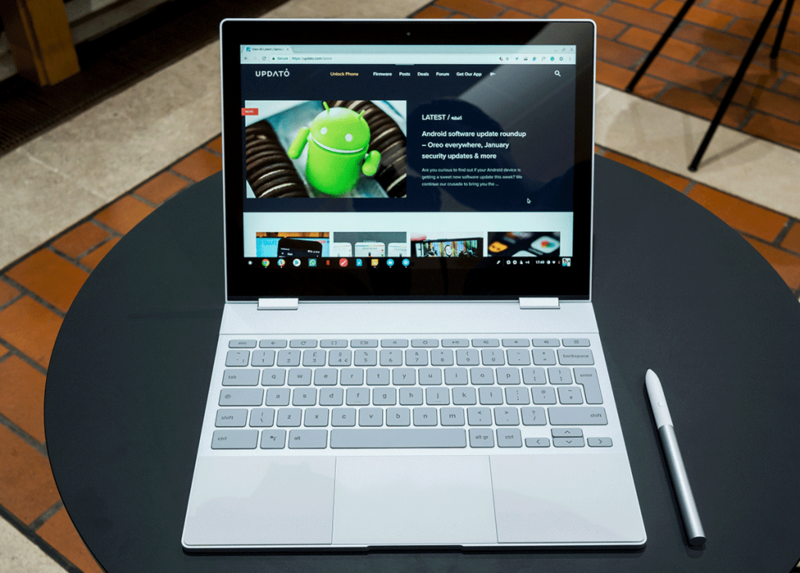 Because the Pixelbook is so light and thin – weighing in at 1.1kg and measuring just 10.3mm thick – it feels supremely portable for a laptop. As a tablet, however, it does start to feel heavy when used for long periods. I would also suggest holding it with the hinges facing up, as the blunter corners on that side of the device will cause your hands discomfort. It would be nice if the bezels around the screen were smaller, but at least you don’t have to worry too much about accidental touches. The glass trackpad doesn’t entirely convince me. It’s marketed as “edge-to-edge,” but it’s not at all responsive near the edges and tap-clicks sometimes fail to register. It’s unclear whether hardware or software is to blame for that, but it can be very frustrating. Proper clicks are rather loud and are difficult to trigger near the top. It also feels a little cramped, but a quick comparison with my Toshiba Chromebook 2 shows it to be roughly the same size. Don’t get me wrong; the Pixelbook trackpad beats every other Chromebook I’ve used and most other laptops too. It’s not that I dislike it, per se, I’ve just been spoiled by the monstrously large trackpad on my MacBook Pro, with its unrivaled all-over force touch capability. If there’s one thing that isn’t lacking it’s the keyboard, which is possibly the best I’ve ever used. The keys have just the right amount of travel and are delightfully springy, making it a joy to type on. It’s also remarkably quiet, which I can’t say of the infuriatingly clacky keyboard on my MacBook. Unlike what you’ll find on many cheaper Chromebooks, the Pixelbook keyboard is backlit. The screen was one of the most impressive features of previous Chromebook Pixels, and the Pixebook continues in the same vein. Retained is the 3:2 ratio that Google assures us is better for web browsing, even if 16:9 is clearly better for watching videos. At 12.3” diagonal, the display is slightly smaller than past Pixels, which in turn leads to a reduced resolution of 2400×1600 (compared with 2560×1700). It’s not a huge difference, but it does cause problems with the display density. I found that at the default resolution of 1200 x 800 items and text appear a somewhat too large for my liking. Change it to the next option up (1350 x 900) and everything is too small. This may or may not bother you, depending on your current setup, but it’s something you should easily be able to adapt to in time. Because it’s a convertible, the Pixelbook’s power button is on the left edge of the device to allow for easy operation in tablet mode. The volume rocker is on the same side, and both are made from the same aluminum as the casing. Unlike some newer flagship phones, you’ll also find a 3.5mm headphone jack. Hopefully, it will be some time before devices of this size see the need to remove it. 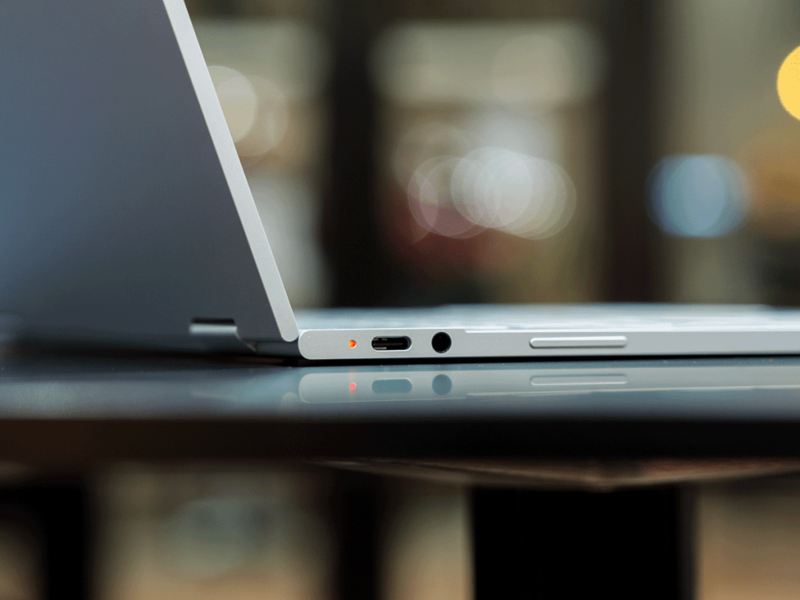 There are just two USB-C ports – one on each side of the device. This makes much more sense than rivals who place both next to one another. I want to be able to plug the charger into whichever side is more convenient at the time. Google gets that, and it’s yet another pleasing design decision to add to the Pixelbook’s lengthy list, showing that a great deal of thought went into usability. Of course, many will bemoan the dearth of other useful ports, but ultimately this lines up with the simplicity of the device. Dongles aren’t a solution most people want to embrace, but that’s not an issue exclusive to the Pixelbook. In not so distant future, it could be rare to see high-end computing products launch with anything other than USB-C ports, similar to what we’ve seen with headphone jacks on phones. Progress, as usual, is not without casualties. As you’d expect given the specs and price point, the performance of the Pixelbook is nothing short of exceptional. I’m a bit of a tab-fiend (my browser is referred to as ‘Tab City’ by my friends), but this device has been up to the task and hasn’t stuttered once that I’ve noticed. Even using more intensive Android apps or games, it’s very difficult to notice any slow-down during normal use. I’ve only been using the device for two weeks, so it’s hard to say how much performance will deteriorate over time, but the early signs are very positive. I’ve had no problems with WiFi connectivity, and if you’re not near a network there’s a smart feature called ‘Instant Tethering’ that can connect to your Pixel phone to use its mobile data. A notification will pop up asking you if you’d like to tether, and all you have to do is say yes and let Google do the rest. You should also be able to use your Pixel’s fingerprint sensor to unlock your Pixelbook, but Bluetooth has to be turned on for both devices, and even then I couldn’t get this to work at all. It’s probably best to stick with pin or password security, for now, a least until Google improves this Pixel unlocking feature. Bluetooth has been reliable the few times I’ve used a set of wireless headphones with it, and audio through the 3.5mm jack is as you’d expect. I’ve already commended the design team for the intelligent placement of the speakers, but unfortunately, the audio quality produced by them is nothing special, severely lacking in bass. There are no fewer than four microphones, which should make for effective noise cancellation during voice and video calls. In practice, call quality has probably been just above average. A basic 720p camera capable of shooting at 60fps is situated in the usual location above the screen and performs admirably. 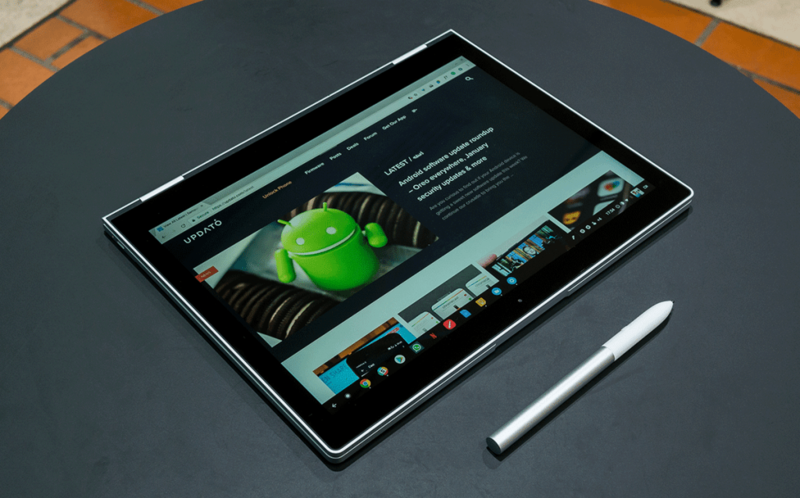 For an ultra-portable tablet/laptop, battery life is going to be a key concern for many prospective buyers. Google advertises ten hours on a single charge, which would be great if it were true. In reality, I was only able to get around eight hours with moderate usage. If you’re someone who plays a lot of games or runs more intensive apps, you might get even less longevity out of the Pixelbook. That’s slightly disappointing, but for most people battery life should last the equivalent of one working day. It does charge very quickly, too, so you wouldn’t have to plug in for too long before you’re on your way again. 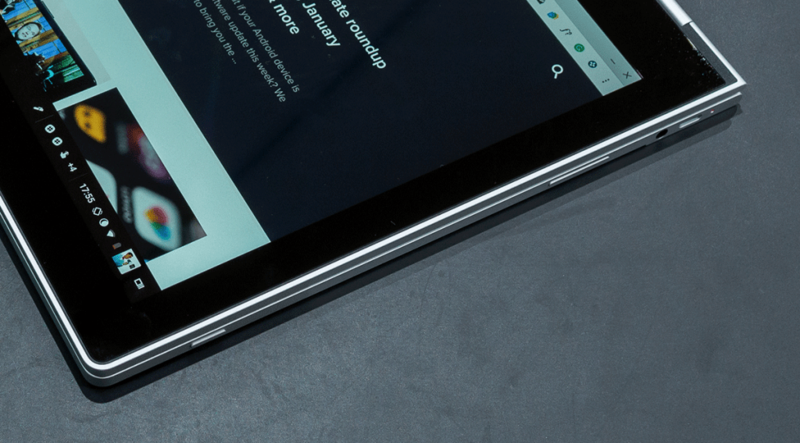 It’s almost seven years since Google released Chrome OS to the public, and it’s made great strides in that time. Even so, there’s more to be done if it’s to shake its reputation as a “glorified web browser” and join Windows and macOS as a fully-fledged operating system capable of catering to everyone. Whether or not it can handle your needs is entirely dependent on what you do with a laptop. 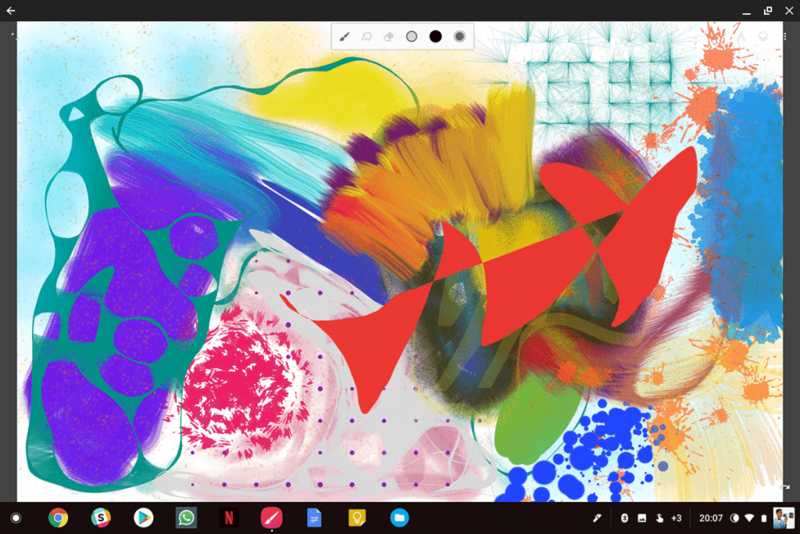 Use cases such as professional video and photo editing or music production are still not possible on a Chromebook, this one included, but the addition of Android apps does give the platform more versatility than ever before. 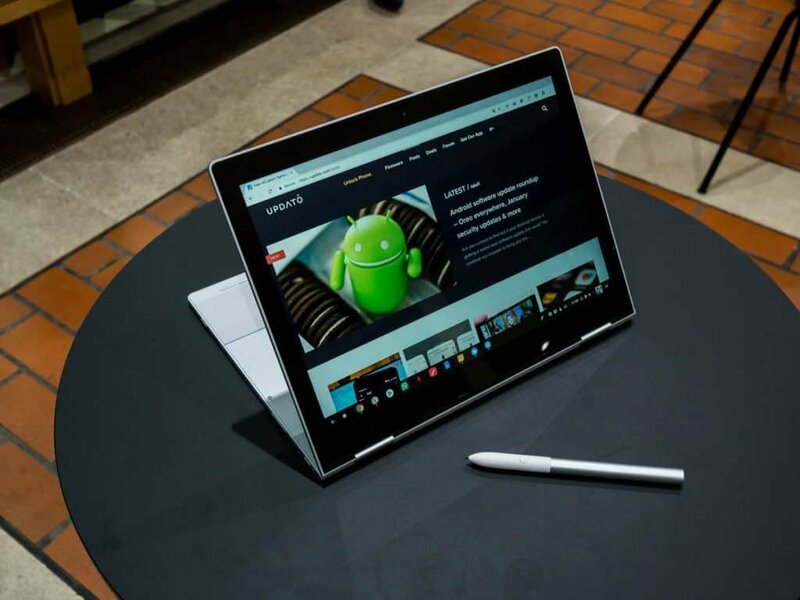 Head to the Play Store on your Pixelbook and you can download a plethora of apps, including less powerful mobile versions of photo editing tools such as Adobe’s Lightroom and Photoshop, for example. Some apps will be optimized to work well on a Chromebook while some will run in phone-mode and won’t offer the same experience. Plenty more won’t be compatible at all, but the situation will only get better over time as more Chromebooks gain Android app support. 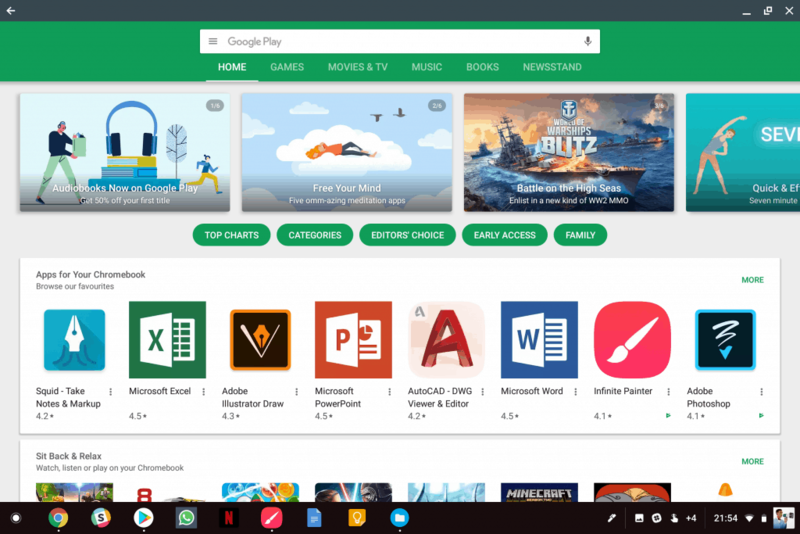 When an app does work well, it’s often indistinguishable from a desktop app on another platform, which is a testament to Google’s efforts to integrate its two ecosystems. The combination of Android apps and Chrome-based web apps does present significant challenges. Not least, what happens when you have both installed side by side. A small chrome icon distinguishes web apps in the launcher (which now looks and functions much like the Pixel phone launcher), but it’s still too easy to select the wrong one. It will take some time to work out which of the two options you prefer, but once you’ve made your decision you can hide the icon of the less preferred app in a folder to avoid selecting it in future. App links can also be a little infuriating sometimes. When I tried to sign into the Slack Android app, I needed to click an authentication link in an email, but on doing so I was signed into the web client instead. Sometimes you’ll get a prompt asking you which version of the app you want to open, as you sometimes do on Android, but at least it can remember your choice for next time if you want. Long-time Android users will also encounter confusion when it comes to navigating the OS, particularly in tablet mode. 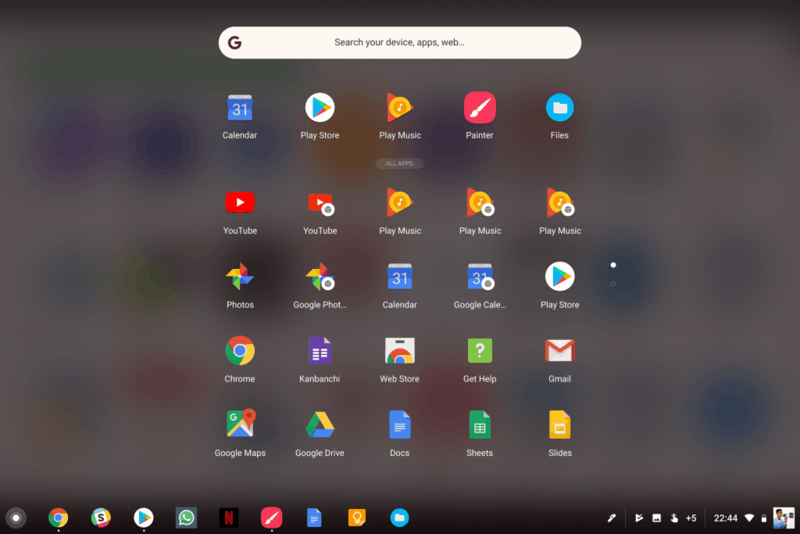 The launcher icon in the bottom left corner (and its corresponding hardware key) look exactly like the home button in the navigation bar of an Android phone or tablet. When running an Android app I often made the mistake of pressing this button thinking it would exit the app and take me back to a non-existent home screen, but instead, this prompted the launcher to pop up. This issue is compounded by the fact that many Android apps operate in a full-screen mode, thus hiding the title bar containing the “X” button you need to close it. You can long press the app’s icon in the dock to bring up a close option or short press it to minimize it, but training yourself to go against your instinct might take some time. WHY ARE THERE TWO BACK BUTTONS? HOW DO I GET “HOME”? Usability would benefit from a more unified overall navigation system and a more intuitive way of handling both Android apps and web apps side by side. While I’m sure Google will work that out in time, the process will likely to force changes on those who have become accustomed to the current behavior, and that’s not good for the platform. Chromebook users still have to accept that the OS is a work in progress. Luckily, the target market for the Pixelbook is probably well aware of this already. Anyone tied into Google’s wider ecosystem will likely have experience with the Google Assistant. It’s cast in a lead role here just as it has been with many of the company’s recent products. The “OK Google” hotword summons it from anywhere other than the lock screen, and for the first time, it also has a dedicated hardware key (positioned between ctrl and alt). 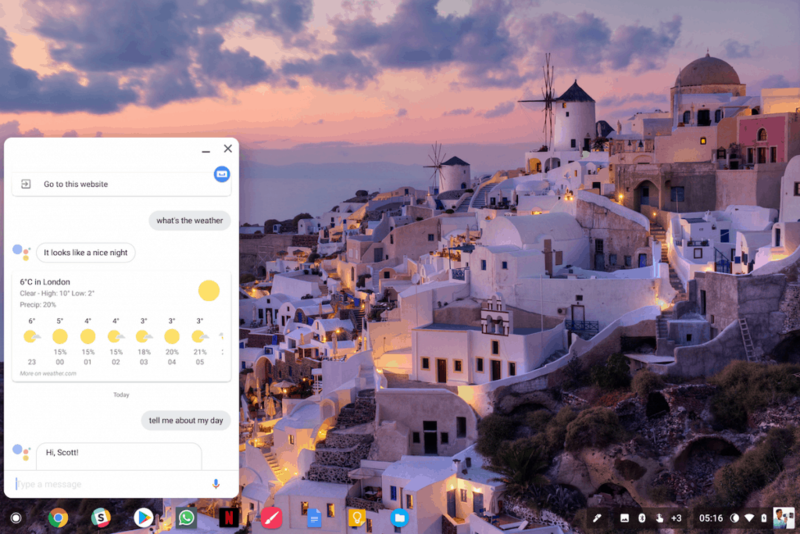 The Assistant is as intelligent on a Chromebook as it is on a smartphone, answering questions and giving you important personal information from other Google services. It also has the ability to play music, open apps, or manage system settings. That leads us neatly onto the Pixelbook Pen (which you may have noticed in some of the photos). The $99 stylus is usually sold separately unless there’s an offer, and it can perform a number of tasks, including calling upon the Assistant to search for things on your screen. Holding the button on the pen while circling text or images will cause the Assistant to pop up and run a search for any pertinent information in what you’ve selected. It’s very good at reading text, and quite good at identifying objects and brands. This functionality operates similarly to Google Lens on Pixel phones and shares the same underlying AI technology. It may not be much more than an impressive demo to show your friends right now, but I can see it becoming much more useful in the future. You can also use Pixelbook Pen to write and draw, which works surprisingly well on the few apps that are currently well optimized for it. These include Google Keep (which you can access from the lock screen for quick note taking), another note app called Squid, the impressive Infinite Painter for creating artistic masterpieces, and handwriting recognition tool Nebo. The pen will work in other apps, too, but don’t expect the experience to be as lag free and smooth without the same optimization. Anecdotally the pen is as good, if not better, than Apple’s pencil. I don’t think I’m best placed to pass judgment on that, though (see the above creation). Annoyingly, Google didn’t think to install a magnet or other solution for attaching the pen to the laptop, but it is now making amends for this omission by offering a free pen loop to every owner. There isn’t much else that’s new in Chrome OS, other than the odd small improvement such as a native blue light filter called Night Light (which you still need to enable in chrome://flags). 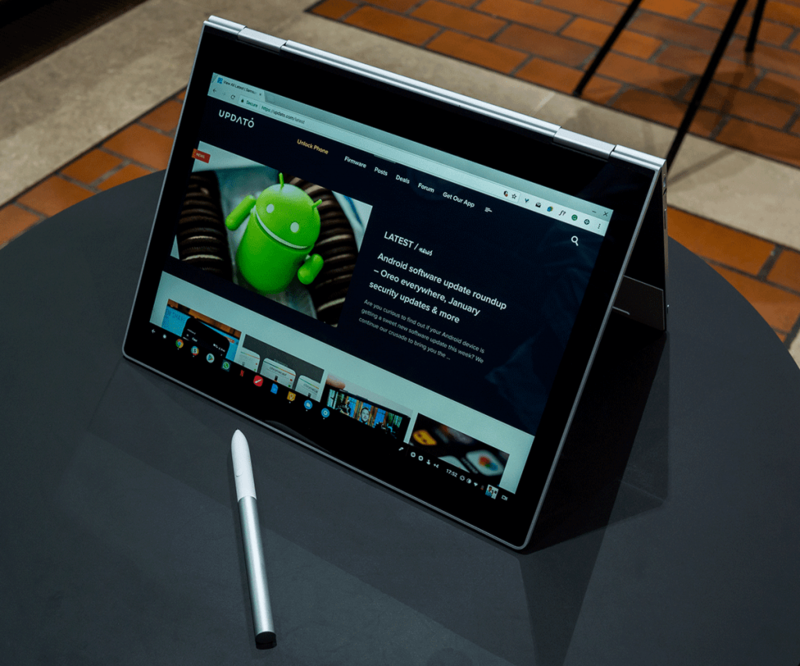 You can expect the Chrome OS/Android convergence to gather pace in the coming months, with more and more Android software features making their way to Chromebooks. Google will support the Pixelbook with far more vigor than its predecessors and should be even more capable in six months time. Google has combined what it learned from the Chromebook Pixel with current computing trends to create probably the perfect form factor for a modern laptop. The Pixelbook is thin and light, it converts seamlessly to a touchscreen tablet, and it has a truly excellent keyboard. It’s also incredibly powerful, even if the OS still isn’t able to fully utilize all of its processing capability. The hardware by itself is infinitely desirable and competes with the very best around. 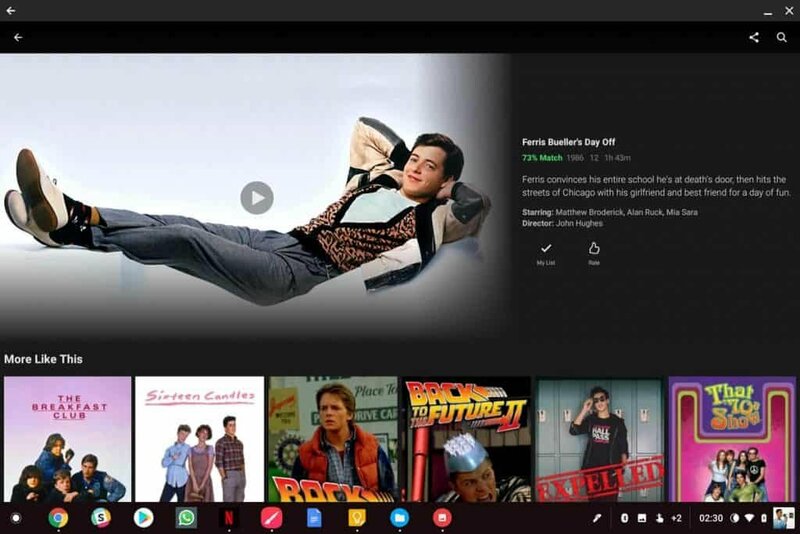 The software is more useful than ever thanks to the availability of Android apps, but there’s still a lot Chrome OS can’t do compared to rival systems. 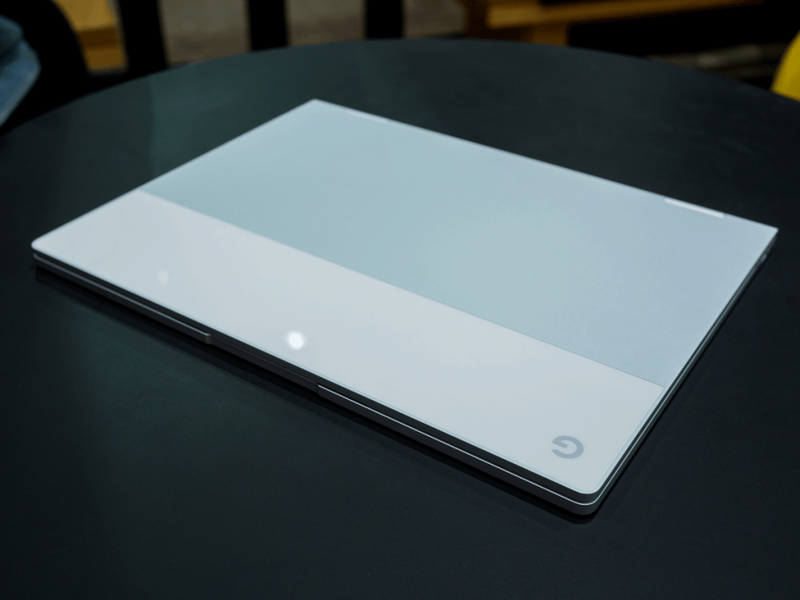 Professionals needing specialist software will be better off with something else, but for someone like me who lives in the cloud and doesn’t do much more than light photo editing, the Pixelbook is a viable and compelling option. That’s not something I could have said about any other Chromebook up to now.